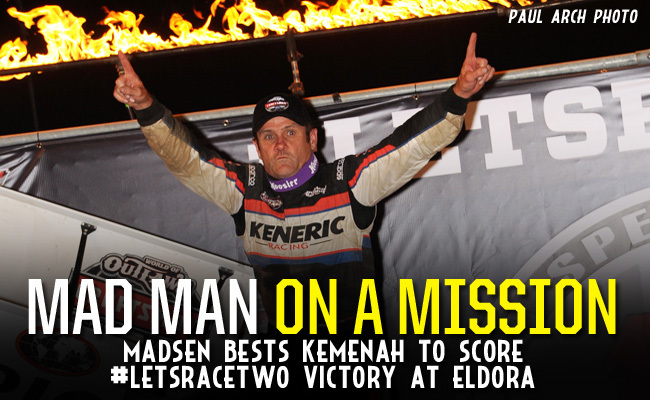 ROSSBURG, Ohio - May 6, 2016 - Kerry Madsen dominated Friday night's #LetsRaceTwo opener at Eldora Speedway as he bested his former World of Outlaws Craftsman® Sprint Car Series colleagues and beat back a challenge from All Star Circuit of Champions regular Chad Kemenah to score his first series win since August 2014. Madsen was on a mission in the night's feature, after starting on the pole in his No. 29 Keneric Health car, he was the class of the field. Kemenah, who charged forward from a 10th place starting position, got within one half second at one point, but was never able to make the pass on the Aussie. "I've never ran a race out there where it was so slow out there - not typically our strong suit," Madsen said. "So the guys worked so hard on the car all night. The car was unbelievable. Just couldn't be happier with the win." After winning the Dash, Madsen joined reigning series champion Donny Schatz on the front row of the 30-lap feature. As main event kicked off, Madsen jumped out to sizable early lead as Kemenah began his run forward. He very quickly picked off several cars and by lap one was in sixth. By lap two, he was in fourth. The leaders caught lapped traffic on lap six and Kemenah took advantage as he closed in on Donny Schatz in second. A two lap battle commenced with Kemenah eventually using a lapped car as a pick. He dove low off of four and got around Schatz as they crossed the start/finish line. Schatz fired back, running back to Kemenah and getting wheel-to-wheel off turn four, but the No. 10H Brilex/Seneca Energy car pulled away. With Madsen slowed by traffic, Kemenah closed the gap to under one half second. He looked for the opportunity but as traffic cleared, Madsen again pulled away from him, widening the gap again by a second. "When I got to lapped cars, I couldn't quite rip around them and then I knew it was time to move but I'm not patient enough to stay down there," said Madsen, a St. Marys, New South Wales, Australia native. "It doesn't feel very fast." Back in third, Schatz had his hands full with the driver he had passed to take over that position initially, David Gravel. Gravel drove his No. 5 Big Game Treestands car to Schatz on lap 15 and cleared him to take the spot on lap 16. Through the remaining laps, Kemenah tried to run down Madsen as Gravel tried to do the same to Kemenah. Ultimately, it was Madsen who became the ninth different series winner of the season. "It was a great win," said Madsen, who led flag-to-flag. "The guys worked so hard. We've been pulling our hair out trying to get fast and it's nice to get it done tonight. This thing was a rocket ship." The win was the 18th series win of Madsen's career. His last series win came in August 2015 at Junction Motor Speedway in McCool Junction, Neb. For Kemenah, a former series regular and native of Elvada, Ohio, the second place run was a boost for his team. "I've got a really, really good race team right now," Kemenah said. "I've got quite a bit of confidence and that pays huge dividends for me. We're just having fun right now and that's what matters. Gravel's third place run was a rebound from Wednesday at Jacksonville when he failed to make the feature. The 23-year-old driver said Eldora has always been good to him. "It was a really good rebound from the other night," Gravel said. "Our balance was a little off early but once we burned that fuel load off and learned how to run one and two, the car came on really good. I thought we probably had the best car those last couple of laps. King's Royal is 40 laps, so I'm looking forward to that, but I really can't complain with a podium finish." Greg Wilson was the night's KSE Racing Hard Charger, advancing 16 positions to finish in seventh while Joey Saldana picked up his fourth quick time award of the season, the most of any series drivers. Earlier in the night, Dave Blaney, the 1995 World of Outlaws champion, had a violent crash in turn one during qualifying. Blaney was transported to an area hospital for evaluation and was subsequently released. The World of Outlaws Craftsman® Sprint Car Series returns to action tomorrow night for the finale of #LetsRaceTwo at Eldora Speedway. For more information and to learn how to purchase tickets, visit WoOSprint.com/Eldora-Speedway. RACE NOTES: Kerry Madsen's last World of Outlaws Craftsman Sprint Car Series victory came at Junction Motor Speedway in McCool Junction, Neb. 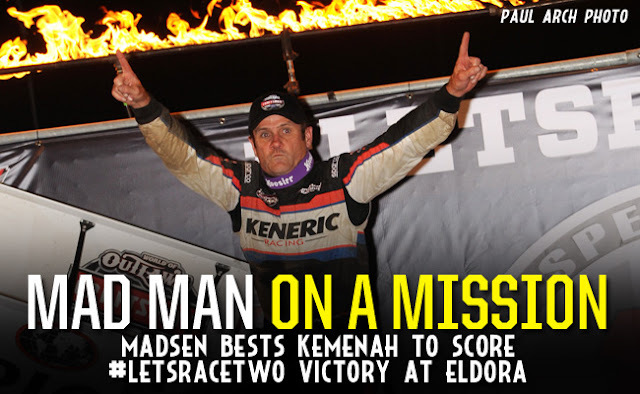 on Aug. 18, 2015… Madsen is the ninth different winner of the season… The win is Madsen's first at Eldora since winning the King's Royal in 2014… Greg Wilson was the night's KSE Racing Hard Charger, advancing 16 positions to finish in seventh… Joey Saldana now has four quick time awards, the most of any driver so far this season… Jason Johnson became the first driver of the season to use a provisional. CONTINGENCY WINNERS - MSD Ignitions ($25 cash): Jason Johnson; MSD Ignitions ($50 cash): Kerry Madsen; Penske Shocks ($50 cash): Chad Kemenah; JE Pistons ($50 cash): Logan Schuchart; VP Racing Fuels ($50 cash): Brady Bacon; Edelbrock ($50 cash): Brad Sweet; Comp Cams ($50 cash): Jason Sides; Morton Buildings ($50 cash): Bryan Clauson; Cometic Gasket ($50 cash): Brad Sweet; Super Flow ($50 cash): Joey Saldana; Craftsman/Sears ($100 cash): Kerry Madsen; KSE Racing Products ($100 product certificate): Greg Wilson; Comp Cams ($50 product certificate): Kerry Madsen; JE Pistons (Set of Rings): Joey Saldana; JE Pistons (Set of Rings): Joey Saldana. SEASON WINNERS: Donny Schatz - 5 (Volusia Speedway Park on Feb. 14, The Dirt Track at Las Vegas on March 4, Stockton Dirt Track on March 18, Stockton Dirt Track on March 19, Silver Dollar Speedway on April 2); Brad Sweet - 5 (Volusia Speedway Park on Feb. 13, Volusia Speedway Park on Feb. 14, Cotton Bowl Speedway on Feb. 26, Ocean Speedway on April 1, Bakersfield Speedway on April 15); Daryn Pittman - 3 (Royal Purple Raceway on Feb. 27, Perris Auto Speedway on April 16, USA Raceway on April 18); Joey Saldana - 3 (The Dirt Track at Las Vegas on March 3, Devil's Bowl Speedway on April 22, Jacksonville Speedway on May 4); Shane Stewart - 2 (Arizona Speedway on March 6, Devil's Bowl Speedway on April 23); David Gravel - 1 (Thunderbowl Raceway on March 12); Jason Johnson - 1 (Placerville Speedway on March 24); Kerry Madsen - 1 (Eldora Speedway on May 6); Jason Sides - 1 (I-30 Speedway on April 26). World of Outlaws Craftsman® Sprint Car Series Statistical Report; Eldora Speedway; Rossburg, Ohio; May 6, 2016.